Vicor now offers the PI354x-00-BGIZ as its latest addition to the company’s 48V Cool-Power ZVS Buck Regulator portfolio, offering a new BGA package option to the existing PI354x-00-LGIZ LGA series. PI354x Cool-Power ZVS Buck Regulator’s high performance ZVS topology enables 48V direct to PoL without sacrificing performance. With step-down regulation from a higher voltage source, engineers can deploy more efficient power distribution architectures, reduce I2R losses, and eliminate costly and inefficient intermediate conversion stages. Operating from 36 VIN to 60 VIN, the PI354x regulates an output voltage ranging from 2.2 V to 14 V and delivers an output current delivery up to 10 A. Power delivery can be further increased by using single wire current sharing without any additional components. The PI354x series is designed for a wide range of applications leveraging higher voltage distribution, including: telecom, network infrastructure, data centers, industrial, battery and lighting applications. When used in conjunction with the Vicor front-end products and factorized power products, the PI354x series enables a complete power chain from AC or HVDC (200 V+) source to PoL. 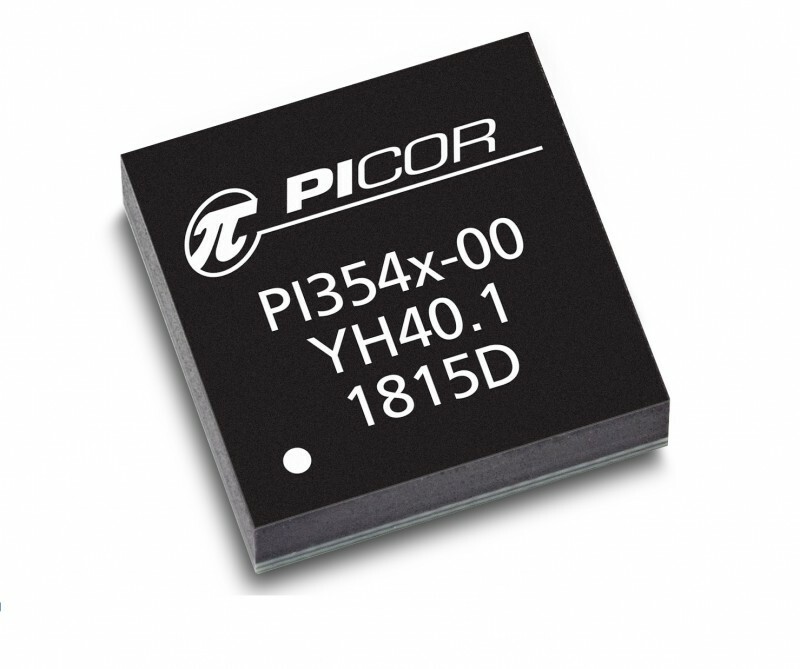 The PI354x series expands and enhances the Vicor Power Component Design Methodology. 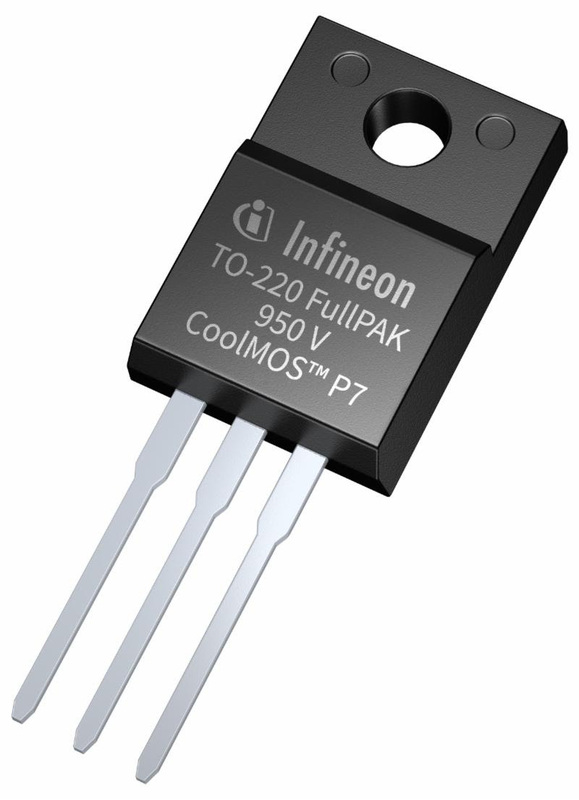 Infineon Technologies has added a new member to its CoolMOS P7 family, the 950 V CoolMOS P7 Superjunction MOSFET. It is designed to meet the needs of applications such as lighting, smart meters, mobile chargers, notebook adapters, AUX power supplies and industrial SMPS applications. This semiconductor solution combines excellent thermal and efficiency performance with lower bill of materials and overall production costs. The 950 V CoolMOS P7 attributes include outstanding DPAK RDS(on) enabling higher density designs. In addition, the excellent VGS(th) and lowest VGS(th) tolerance make the MOSFET easy to drive and design in. Similar to the other members of the P7 family from Infineon, this component comes with integrated Zener diode ESD protection. This results in better assembly yields and therefore less cost, and fewer ESD-related production issues. The 950 V CoolMOS P7 enables up to a 1% efficiency increase and from 2˚C to 10˚C lower MOSFET temperature for more efficient designs. This component offers also up to 58% lower switching losses compared to previous generations of the CoolMOS family. Compared to competing technologies in the market the improvement is more than 50%, according to the company. The 950 V CoolMOS P7 comes in TO-220 FullPAK (shown), TO-251 IPAK LL, TO-252 DPAK, and SOT-223 packaging. This makes it possible to change from THD to SMD device. 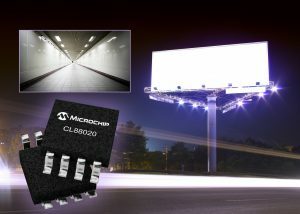 A next-generation sequential linear LED driver for offline lighting applications is now available from Microchip Technology. The CL88020, an extension of Microchip’s CL88XX family, is designed to drive a long string of low-cost LEDs directly from the 120 VAC line input. 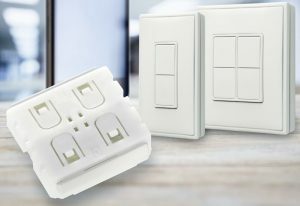 The product allows customers to create reliable, cost-effective and compact LED lighting applications by having High Power Factor (PF) without the need for switch-mode power conversion which is typically required for LED lighting design. The CL88020 was designed to minimize driver circuit component count to allow for a very small and efficient design. The simple design allows for a single-layered Printed Circuit Board (PCB) design. Unlike the conventional AC-DC switch mode power supply, the basic driver circuit consists of the CL88020 IC, two small ceramic capacitors and a bridge rectifier only. High-voltage capacitors, transformer or inductors, electromagnetic interference (EMI) filters or Power Factor Correction (PFC) circuitry are not required. This allows for a smaller solution size and a lower overall bill of material (BOM) cost as compared to traditional LED solutions. CSEM and Sefar AG recently announced the development of an affordable method for increasing the attractiveness of OLEDs for lighting for buildings as well as consumer electronics.Thanks to a project supported by the Swiss Confederation (CTI project), the CSEM and Sefar solution is transparent but still highly conductive. The flexible electrodes are made of fabric substrates comprising flexible metallic wires and polymeric fibers that are woven together in a highly transparent and flexible polymer. These fabric substrates (SEFAR TCS Planar) are manufactured using low-cost, high-throughput processes under standard ambient clean room conditions. The substrate is coated with a thin-film (tens of nanometers) layer of a solutionprocess conductive polymer. 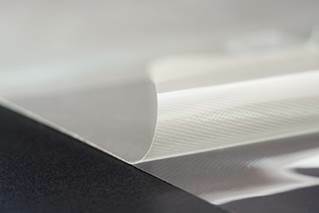 The high electrical conductivity of the metal wires in the fabric substrate ensures that the electrode displays high conductivity over long distances, even with an ultra-thin layer of the conductive polymer. EnOcean recently selected Nordic Semiconductor’s nRF51822 Bluetooth low energy SoC for its Dolphin PTM 215B pushbutton transmitter module, which is well suited for use in smart lighting applications. Using a miniaturize electro-dynamic energy transducer to convert motion, light, or temperature differences into electrical energy, the module is an excellent option for engineers designing flexible, energy-efficiency in smart building and IoT lighting applications. The nRF51822 was selected because harvested energy is sufficient to power wireless control of Bluetooth low energy peripherals such as smart light bulbs. A powerful multiprotocol SoC, nRF51822 is built around a 32-bit ARM Cortex M0 CPU with 256/128 KB flash and 32/16 KB RAM. The embedded 2.4-GHz transceiver is fully compliant with Bluetooth 4.2. 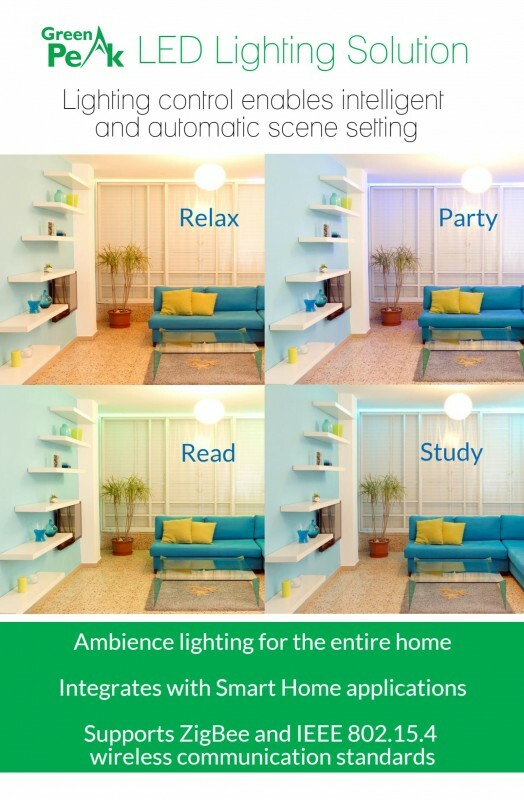 Arduino enthusiasts will be excited to learn that Infineon Technologies has announced two new shields for RGB lighting and motor control. You can use the shields—which are compatible to Arduino Uno R3—with the XMC1100 Boot Kit, which is equipped with a 32-bit microcontroller of the XMC1000 family (uses the ARM Cortex-M0 processor). 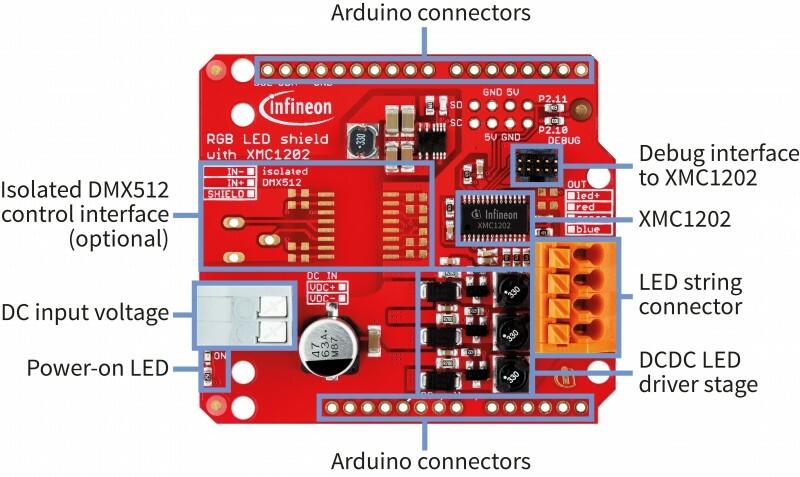 The RGB LED Lighting Shield for Arduino features an XMC1202 microcontroller with its Brightness Color Control Unit (BCCU) for LED lighting control. The high-current DC Motor Control Shield for Arduino contains the Infineon NovalithIC BTN8982TA integrated half-bridge driver for motor control. The RGB LED Lighting Shield evaluation board enables you to use different LED light engines for fast prototyping. 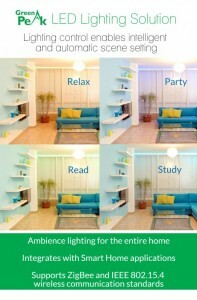 It has three independent output channels for flicker-free control of multicolor LEDs. The BCCU automated hardware engine provides a cost-effective LED lighting solution dimming and color mixing. You can expand the shield with a DMX interface for lighting and audio nodes or a 24-GHz radar sensor for motion detection. The DC Motor Control Shield with BTN8982TA simplifies the prototyping of DC motor control designs. It can drive two unidirectional DC motors or one bidirectional DC motor. The shield features two NovalithIC BTN8982TA fully integrated high-current half-bridge drivers optimized for motor drive applications. The BTN8982TA includes three ICs: two power chips (one p-channel high-side MOSFET and one n-channel low-side MOSFET) and an integrated driver IC with one logic circuit to control and monitor the power. Other features include are diagnosis with current sense and slew rate adjustment. Until end of January 2015, both the RGB Lighting Shield with XMC1202 for Arduino and the DC Motor Control Shield with BTN8982TA for Arduino will be available for purchase from Newark element14. After that, they’ll also be available from Infineon and its distributors.